Suzanne Bocanegra is an avid collector of curious things. This tendency is particularly well evidenced by the two drawings included in this exhibition, Brushstrokes in a Victorian Flower Album: Long Headed Poppy (2000) and Drawing Everything in My House: Towels (2001). In the earlier drawing, Bocanegra has meticulously dissected the building blocks of the red poppy from Henry Terry’s A Victorian Flower Album, originally published in the late nineteenth century. In Bocanegra’s version, the individual brushstrokes comprising this flower are laid out across a series of white paper squares, which are then grouped together by size. 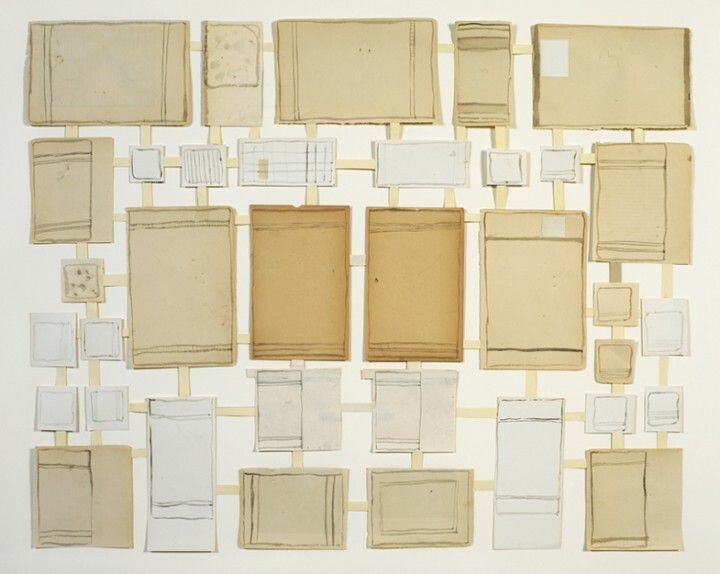 Bocanegra is fascinated with the way information is organized and displayed, and she carefully arranges her drawings, with the precision of a library scientist. Here, this ordering is complicated by the abstract nature of the strokes themselves, encouraging us to consider what was lost through Bocanegra’s dissolution of the original into its most basic parts. Bocanegra has noted that she is interested in how new categorizations can change our initial perception of something. In this piece, she has created a unique taxonomy of brushstrokes for Terry’s botanical study, transforming the poppy into a meditation on the very process of drawing itself. Drawing Everything in My House: Towels likewise explores the emergence of meaning through classification. 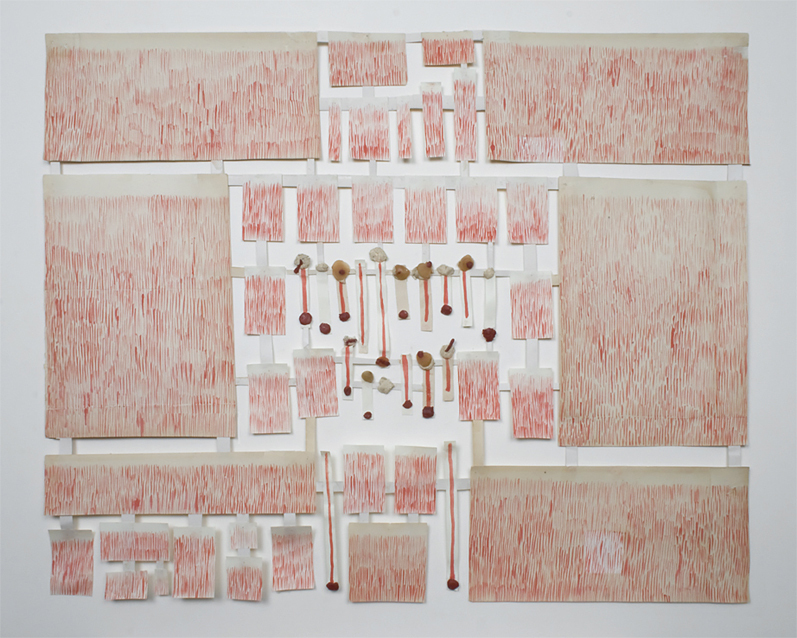 This work is part of a larger series, “Drawing Everything in my House,” in which Bocanegra attempted the daunting task of documenting the never-ending accumulation of stuff in her home. Inspired in part by Jean-Baptiste-Siméon Chardin’s eighteenth-century domestic scenes and Giorgio Morandi’s early to mid-twentieth-century drawings of bottles, she divided the contents of her home by type in an effort to exert some measure of control over the volume of material by which she found herself surrounded as a young mother. The drawing included in this exhibition consists of thirty-five towels, each individually fashioned out of used paper, loosely outlined in ink, and held together by paper bands in an asymmetrical grid. While Bocanegra’s work often seems obsessive in scope, there is an austerity to her use of color and composition that echoes with minimalist undertones. The structure and palette of Drawing Everything in My House: Towels, for example, invoke the subtlety of an Agnes Martin painting, while Bocanegra’s interest in the process of collecting suggests a relationship with seriality. 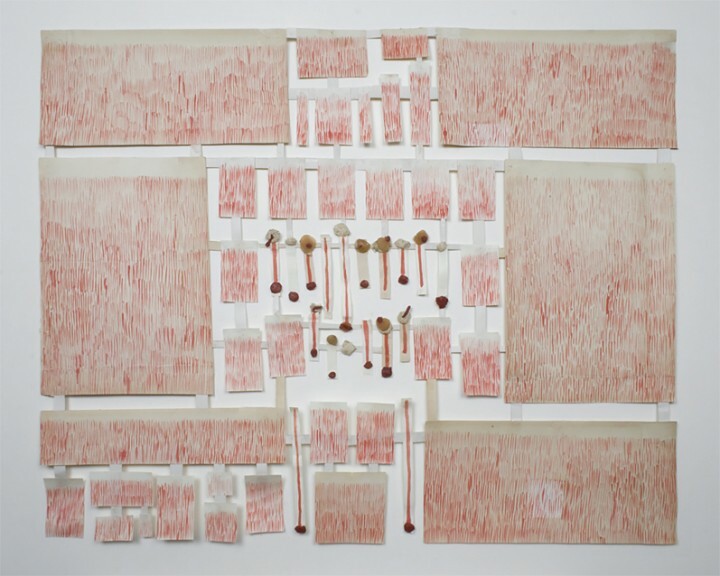 At the same time, these handmade collections also situate her work in dialogue with that of contemporary artist Mary Kelly and others who use archival techniques to personal ends. While this particular composition recalls the early infographic of the nineteenth-century encyclopedia, the individual towels suggest something altogether more personal. Traces of writing are visible on the backs of several towels, evoking a sense of repeated use enhanced by the fraying edges of the paper. Out of this simple collection of towels emerges a portrait of an active home. Suzanne Bocanegra (b. 1957, Houston, TX) earned her BFA from the University of Texas, Austin (1979) and her MFA from the San Francisco Art Institute, California (1984). She won the Prix de Rome (1990). She has been the recipient of grants and fellowships from the Pollock-Krasner Foundation (1988, 1990, 2003); the Marie Walsh Sharpe Arts Foundation (1993); the New York Foundation for the Arts (1989, 1993, 2001, 2005); the National Endowment for the Arts (1994); the Joan Mitchell Foundation (2001); the Tiffany Foundation (2001); and the Danish Arts Council (2007). Bocanegra recently has been featured in solo exhibitions at the World Financial Center Winter Garden, New York (2009); the Tang Teaching Museum and Art Gallery at Skidmore College, Saratoga Springs, NY (2010); and Site Santa Fe, Santa Fe, New Mexico (2011). Her lecture piece, When a Priest Marries a Witch, an Artist Talk by Suzanne Bocanegra Starring Paul Lazar, premiered at The Museum of Modern Art, New York (2010) and traveled to: the Wexner Center, Columbus, Ohio; the Tang Museum, Skidmore College, Saratoga Springs, New York; James Cohan Gallery, New York; the Performing Garage, New York; Princeton University, Princeton, New Jersey; the Prelude Theater Festival, New York; the Cynthia Woods Mitchell Center for Arts, Houston Museum of Fine Arts, Houston, Texas; the Fusebox Festival, Austin, Texas; and Mt. Tremper Arts, Mt. Tremper, New York. The lecture also opened for a week-long run at The Chocolate Factory Theater, New York (2011). Bocanegra’s large-scale performance piece, First Person Shooter, debuted at the Ohio State University, Columbus, Ohio (2011). Her most recent work, entitled Bodycast, an Artist Lecture by Suzanne Bocanegra starring Frances McDormand, premiered at the Carnegie Museum, Pittsburgh (2013) and traveled to: the Hammer Museum, Los Angeles; the Henry Museum, Seattle; Commonweal, Bolinas, California; and Next Wave Festival, the Brooklyn Academy of Music, Brooklyn, New York (2013). Bocanegra lives and works in New York City. More information about her work can be found at www.suzannebocanegra.com. Alexis Lowry Murray is the curator of the David Winton Bell Gallery, Brown University. Before joining the Bell Gallery, she was a freelance arts producer in New York City, where she worked closely with the public arts organization Creative Time on projects with Paul Ramirez Jonas, Trevor Paglen, and Tom Sachs. She has an MA in Art History from the Institute of Fine Arts, New York University, and is currently working on her doctorate, which is about Land Art in 1960s.